Just when I thought Dogfish Head Craft Brew Ales has done it all…they surprise me again with another amazing concoction. 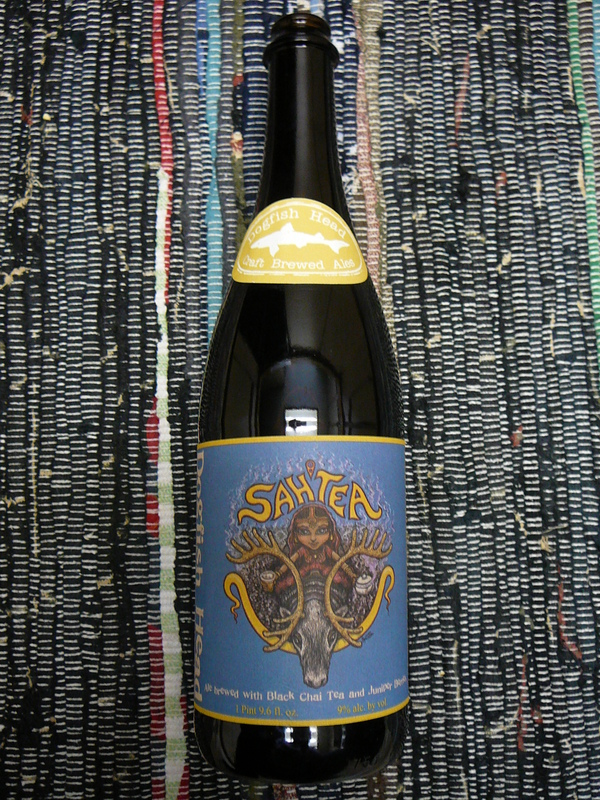 While browsing through a local beer store I stumbled upon one of Dogfish Head’s rarities, Sah’Tea. Of course the label on the bottle is gorgeous but after reading the ingredients I was a little leery of what was inside. Boy was I wrong! boiled in wooden tanks by heating river rocks in a wood fire until white-hot and adding them directly into the tank. Dogfish Head, being who they are, cannot pass up a chance (or challenge) to craft a beer using the same techniques and ingredients as the originators. Like the Finnish recipe, Dogfish Head brews Sah’Tea using rye and Finnish-foraged juniper berries. To put their own signature on the brew, Dogfish adds their own twist on the 1,200-year-old recipe by adding a tea type blend of black tea, chai tea, cardamom, cinnamon, ginger, cloves, and black pepper…yes, black pepper. To further replicate the Finnish brewing process, Dogfish caramelizes the wort by throwing in white-hot river rocks and then ferments the beer with German Weizen Yeast. “So what’s it like” you ask? An exotic aroma of spiced tea and raisins swirl around the nose. On first sip I caught flavors of nutmeg, cinnamon, coriander, banana, and sweet potato. Sah’Tea is medium bodied and well-balanced with a black tea and spice finish. Dogfish Head founder and President, Sam Calagione, describes Sah’Tea as “a banana bread-like, unique beer.” And he’s not kidding! Sah’Tea is a lovely, exotic, unique beer. 9.0%ABV so be careful…be very, VERY careful. Being one of Dogfish Head’s rarity beers I would suggest running out to your nearest beverage store and picking up a bottle, or 3 or 4. You won’t be sorry!